The American Red Cross is in the list of organizations that have the most notable blood draws performance. It’s one of the main reasons why the organization offers a variety of related training programs. Most employees of the Red Cross work as volunteers but there are employees who get salary as well. Also, the Red Cross has a bunch of locations all over the country which means that people can start training and working in any state. In fact, you’ll be able to find a location that is quite close to the place where you live. Starting the Red Cross Phlebotomy Training, you’ll be able to learn how to draw blood and work with patients. It will give you an opportunity to find the right job and further your career in the future. Consider the fact that you aren’t obliged to work for the American Red Cross if you get your training there. Volunteering is also not an obligatory option but still, it’s a great opportunity to get some experience and improve your skills. In case you want to start your career as a phlebotomist and don’t know where to get your training, the American Red Cross is exactly what you need. So, what options are offered for those who start their phlebotomy training at the Red Cross? Below there is detailed information on the issue. 2 What Is the Cost of the Training? 3 What Does the Phlebotomy Program Include? 4 Is There Safety Training at the Red Cross? 5 Is a Certification Exam Required? 6 Who Can Start the Red Cross Phlebotomy Program? 8 What Skills Are Required to Become a Phlebotomist? 10 What Other Training Programs Are Offered at the Red Cross? 11 Is There An Opportunity to Advance Your Career? 12 What Are the Advantages of Working at the Red Cross? 13 Is It a Good Idea to Start Phlebotomy Training at the Red Cross? Most phlebotomy programs have rather common requirements for those who want to enter the course. First of all, you should be 18 years old minimum. Also, you need to have a high-school diploma or GED. Pass a physical exam that includes a tuberculosis test. Most other programs don’t have all these requirements so it may seem that the list is pretty full. Nevertheless, the Red Cross on your resume will add you some points making you looking more reliable and skillful. When you enter the workforce market, you should know that the place where you got your training will be taken into account. Starting your phlebotomy training at the American Red Cross, you should be able to pay $965 for the whole course. The price includes tuition and class fees. The cost of other courses is usually about $700-$1500 which means that the Red Cross program has a middle price. It’s clear that it isn’t one of the most expensive courses. In fact, it’s an excellent deal as you get your education at one of the most recognizable organizations in the medical sphere. One another significant aspect is that the groups are rather small and include about 8-16 students. It means that each student will be able to get all the necessary skills and knowledge. What Does the Phlebotomy Program Include? To begin with, the course is divided into two parts. The first part contains 80 hours of theoretical classes while the second part has 40 hours of lab work/hands-on work. The theoretical part provides basic phlebotomy knowledge but still, it doesn’t mean you’ll be learning only blood drawing issues. How to transport blood to clinical labs. As soon as the theoretical part is finished, the students start their practical training. These two types differ significantly because of the needles’ types and the equipment that is used during the procedure. The practical courses are held under the supervision of your teacher or professional phlebotomist with the usage of training arm. It’s a really important part as you should be able to perform various types of venipuncture as you’ll be working with various patients. Not every patient has a so-called ‘good’ vein. For example, you may have some problems blood drawing from an obese person. In other words, knowing all aspects and technics, you’ll be able to perform your job on a high level. The Red Cross Phlebotomy training provides you with all you need to start a successful career. Is There Safety Training at the Red Cross? Safety takes a critical place at the phlebotomy training. Of course, the Red Cross Program isn’t an exception. The program contains the course of safety procedures provided by the Center for Disease Control (CDC). The course contains information on protecting yourself and your patients. The main point you should keep in mind is that sure nothing should get contaminated. The students are explained about the importance of various protective gears. Also, you’ll be taught about such aspects as proper labeling and transferring samples. It’s absolutely important to make sure that each sample has a proper label. If there are any mistakes it can have a dangerous effect on the patients. That is the point why phlebotomists need to have indemnity insurance. Also, you for sure need to learn lab safety procedures as you should be able to perform every procedure properly while working at the lab. It will let you protect yourself and organize your job properly. Is a Certification Exam Required? As soon as your Red Cross phlebotomy training is finished, you’ll be able to take a certification exam. It will be taken through the National Healthcareer Association (NHA). Nevertheless, most states don’t have such a requirement as a certification. Consider the fact that it will make your job search faster and you’ll be able to get a higher salary. Consider the fact that you don’t need a lot of time to get your certification. You only need some extra training. But still, your training may take months. Who Can Start the Red Cross Phlebotomy Program? If the applicants meet all the requirements, they can apply for the program and start their training without any problems. People who want to start their career in the medical sphere. Phlebotomy is one of those programs that can be a perfect choice for beginners. But still, most people work as phlebotomist during their whole life. Most medical facilities prefer to hire individuals who have finished accredited programs. 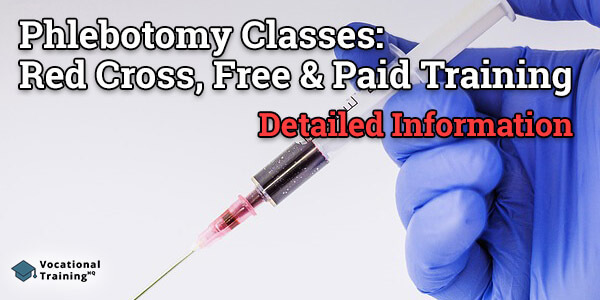 Healthcare professionals who want to get some phlebotomy skills. Venipuncture skills can be useful for any specialist who works in the healthcare sphere and the Red Cross program is a perfect option. There is a condensed program that lasts for 20 hours. This program is available only for those individuals who have any other medical education. The program provides skills and knowledge that are absolutely important for phlebotomists. First responders and rescuers that need to get some phlebotomy skills. The Red Cross offers the ‘intense’ program for such individuals. It’s called an EKG Technician and Phlebotomy program and includes CPR training. You’ll learn a bunch of techniques each phlebotomist should know. Also, you’ll learn how to use... ...various types of equipment. In fact, the Red Cross Phlebotomy training is an ideal option for those who want to start their career in the healthcare field or want to get some new skills to improve their career. The fact is that there is an incredible demand for phlebotomists all over the country. As a significant part of the population get older, more blood tests are required. Also, during the last few years, a lot of new technologies appeared. All these technologies allow us to determine lots of different illnesses and conditions with the help of blood tests. All these aspects influence the growth of phlebotomists’ shortage. It’s rather expected but most phlebotomists work at hospitals. Hospitals all over the country hire new phlebotomists regularly in order to keep up with demand. In case you aren’t able to find a job in any local hospital, there are lots of other options that most people don’t usually take into consideration. Look for some offers at emergency clinics and private practices. Also, you need to look for career opportunities at your local blood banks or even the Red Cross itself. Moreover, some people after finishing their phlebotomy training may start their own business. Recently mobile phlebotomy gains popularity. Mobile phlebotomists visit their patients themselves. It offers some flexibility to the specialist as there is an opportunity to set specific working hours. The only issue you can face is the creation of your own ‘client base’. Nevertheless, you can overcome it if you’re a qualified specialist and perform your job well. Consider the fact that phlebotomists’ rates grow constantly. From 2014-2024, 25% growth is expected. It means that you won’t face any difficulties looking for a job. Also, you can get a rather high salary starting your phlebotomy career. On average, the salary of a phlebotomist is about $32 000 per year. What Skills Are Required to Become a Phlebotomist? The American Red Cross program provides all the skills that are necessary to become a phlebotomist. The students learn the educational side and physical requirements during their training. But still, it’s not enough to learn books by heart and train to draw blood. A bunch of particular characteristics is also required. It doesn’t mean that you cannot perform your duties without these skills but you may face lots of difficulties during your work. People skills: Performing your duties, you’ll communicate with lots of people daily. You should be able to communicate properly with any patient including elderly people and children. You may meet people that are scared, awkward or rude and you should be able to understand them and work with them without any issues. Ability to work as a team-player: Working as a phlebotomist you’ll be obliged to work in a team with various people. You need to be able to work well in a team including lab workers and other medical staff. Strong attention to detail: Phlebotomist should be able to perform such duties as samples labeling as a mistake can affect your patients. So, you need to be able to concentrate and pay attention to details. Highly organized: Performing your duties as a phlebotomist you should be not only attentive but highly organized as well. It’s important to keep your instruments and working space in order and be able to organize it properly. Always follows safety procedures: Of course, during your phlebotomy training, you’ll learn safety rules but you need to make sure that you never forget about these rules performing your job. Ability to stand for several hours at a time: Working as a phlebotomist you need to have enough stamina to perform your job properly. It’s especially important for those who work in a hospital. This requirement is significant as you must spend most of your working hours on feet and do a lot of walking. It happens that some hospitals don’t want to hire phlebotomists who have no prior experience. To overcome this issue, you can become a volunteer at the Red Cross. Also, you can become a volunteer in many other organizations and facilities. All these offers are your perfect opportunity to get the experience you need to start your successful career. You may continue being a volunteer even after starting your career. Also, you can find some options in hospitals as they may look for volunteering phlebotomists. You can address those hospitals that are under-staffed or in case there is any disaster and hospitals need some extra help. What Other Training Programs Are Offered at the Red Cross? The American Red Cross offers a variety of training programs and phlebotomy training is only one of the available options. You can look for other programs as additional or main education. It’s never a bad idea to enroll in more than one type of training class. The more you take, the more opportunities can arise for you in the healthcare industry. In fact, it’s a great idea to apply for more than one training course. It is a great opportunity to get more opportunities to start your career. Consider the fact that after finishing your education at the Red Cross, you can become an instructor. Red Cross instructors help 9 million people to learn life-saving skills each year. There are two options that are a regular instructor or a disaster relief instructor. Is There An Opportunity to Advance Your Career? Despite the fact, phlebotomy is an entry-level position it can be your perfect opportunity to start and promote your career. In fact, you don’t need to be a phlebotomist during your whole life and start a new career improving your skills and knowledge. If you get enough experience and promote your skills enough, you can become a therapeutic phlebotomist or even get a supervisory position. In case you want to continue your education, there are lots of opportunities. To say the truth, many nurses and doctors started their career in the healthcare sphere as phlebotomists. The reason is that this way is rather quick and cheap so you can easily enter the medical sphere. Later you always can enter some other medical training programs and build a successful career. What Are the Advantages of Working at the Red Cross? In fact, you aren’t obliged to work for the Red Cross after finishing your training there but still, it’s a great opportunity to start your career. At the Red Cross, you can gain the kind of experience that isn’t available at hospitals and other medical facilities. It’s because the Red Cross has other goals and priorities. Moreover, you can get absolutely precious experience working for the Red Cross as it’s a provider of half of the nation’s blood supply. It means that the organization needs absolutely professional phlebotomists in its team. After finishing the Red Cross Phlebotomy program, you get a priority among other candidates who want to start their career there. Is It a Good Idea to Start Phlebotomy Training at the Red Cross? Of course, there are lots of options for those who want to become phlebotomists. Nevertheless, trustworthy education guarantees you more opportunities to start your successful career. The Red Cross offers its students not only a high level of phlebotomy training but also a bunch of other useful skills. After finishing your training, you’ll be able to take your certification exam. After it, you can become a volunteer or start your career at the organization. One other significant point is that the cost of the Red Cross training program is middle so you don’t need to spend lots of money. Moreover, you need even less than one year to finish your education. Finally, you can get an absolutely significant experience working as a volunteer after finishing your training. In other words, the Red Cross is your perfect opportunity to get your phlebotomy training. Moreover, you can find a facility in any state. Just address the closest facility to get more information on the available training and career options. what time or times do the phlebotomy classes start?